You're just a weekend away from acing your FAA Powered Parachute Written Exam (Knowledge Test) when you train with your KING Sport Pilot Powered Parachute Interactive Video Ground School & Test Prep Course. Chances are you'll score 90% or above. More than 500,000 KING-trained pilots already have. Your Sport Pilot Powered Parachute Pilot course covers the subject matter in an interesting and entertaining way. KING's engaging video and bold, full-screen graphics coupled with highly interactive questions will reinforce your learning and keep your motivation sky high. No other training is as thorough—or faster. No other sport pilot ground school is as powerful, fun or well-organized as this classroom on computer. Because your KING Sport Pilot Powered Parachute Ground School & Test Prep course harnesses the power of your computer, you'll be fully engaged—you'll learn faster and remember better. And when you're ready, you'll get your FAA Powered Parachute Written Test sign-off (endorsement) and graduation certificate. The FAA frequently updates the required knowledge for each test. King Schools continuously updates the Sport Pilot Powered Parachute course, ensuring you get the most current instruction available anywhere. Supported Operating Systems: both 32-bit and 64-bit versions of Windows XP, Vista, Windows 7, or Windows 8. King Schools provides a method that will ensure your success as it has for pilots over the past 40 years by delivering over 1 million courses. In fact, KING courses have helped 1 out of 2 pilots flying today. KING´s clear, simple, fun presentation means you get the big picture you need to be the true master of your flight. You´ll have the practical tools to really use your Sport Pilot Parachute Certificate (aka - Sport Pilot Parachute License). And having the big picture means you´ll be ready to deal with the unexpected. You´ll know how to make timely decisions and take action before you and your passengers are at risk—so your flying will be confident and fun! And when you´re ready, you´ll get your FAA Sport Pilot Parachute written test sign-off (endorsement) and graduation certificate instantly online! This course is designed to prepare you to take and pass the FAA Sport Pilot Powered Parachute Knowledge Test. On Disc for Windows media requires a 32-bit or 64-bit version of Windows XP, Vista, Windows 7, Windows 8, or Windows 10. Warning: You can’t just memorize test questions and expect to pass your FAA Sport Pilot Powered Parachute Written Test. Why? The FAA used to make their test question banks publicly available; however, they have not done so for many years. In fact, the FAA has recently gone through their entire database and changed every single test question and answer in order to eliminate test question memorization. No one, including test prep educators, has access to the FAA question banks. To be a safe and competent pilot-in-command, and to pass your required tests, there is no shortcut. You must acquire the necessary pilot knowledge. First, select the "Click HERE to Start" menu icon on your Sport Pilot Parachute Ground School & Test Prep Course home screen. From there, you will learn how to use the course effectively with and gain insight to the features and benefits of the course. Just follow the path from start to finish; it´s that easy. Of course you can skip around if you chose but we recommend staying on the lesson path. As you begin your flight training lessons, you will want to review the pilot skills courses as they will tie into your practical flying. Once you have passed the FAA Sport Pilot Parachute Knowledge Test, it´s time to start your Sport Pilot Practical Test Course so you will ace your FAA Sport Pilot practical test (a.k.a. Sport Pilot checkride). Some lessons will be more challenging than others. The advantage of having a home study course is you can repeat any lesson over and over again. You can always call or send us feedback about concepts or questions for further clarification. 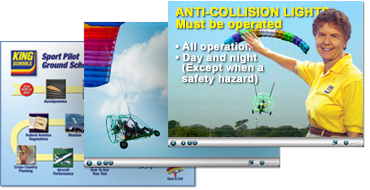 The Sport Pilot Powered Parachute Ground School & Test Prep Course contains approximately 7.5 hours of video lessons. King Schools Sport Pilot Powered Parachute Ground School & Test Prep Course contains a text question explanation icon that contains a thorough explanation of the test questions. Click on the icon when you are in the question review that follows each lesson segment and you will have a pop-up window containing a thorough explanation of the test question. You have lifetime access to your Sport Pilot Powered Parachute Ground School & Test Prep Course. Consider purchasing King Schools Sport Pilot Powered Parachute Practical Test Course if you haven´t already. This course will prepare you for your Sport Pilot Powered Parachute checkride (Also referred to as the Sport Pilot Powered Parachute practical test). It includes footage on how to flawlessly execute in-flight maneuvers as well as prepare you for the oral test. Your passing the test is guaranteed!